"Seasonable Hints - Dominion Experimental Farms (Canada) - Spring of 1931 - Number 51." 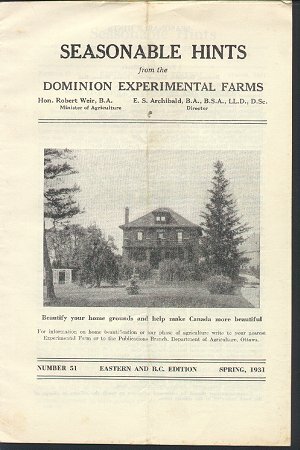 (1488) Seasonable Hints - Dominion Experimental Farms (Canada) - Spring of 1931 - Number 51. -Condition: Good Plus Has been folded to fit in envelope. Informational pamphlet. Photo of farm house on the front with caption "Beautify your home grounds and help make Canada more beautiful". Inside information includes: Various Livestock suggestions, Production of Grain, Diseases of Potatoes, Preparing Soil for Planting, Grafting Fruit Trees, and more. Issued for the Eastern and B.C. parts of Canada. Pamphlet measures 6 1/2" by 9 3/4" and has 16 pages. Price: $4.00 + shipping.